As fall approaches, I am reminded of how I got to where I am today. Before the fall of 2007 I was a full time student working on a Masters in Christian Education, I was working in areas of environmental education, child care, and preparing for a life of ministry. The previous winter I had picked up a crochet hook at the farm house and my mother-in-law taught me the basics. I could chain and single crochet, which is enough to get one hooked (pun intended). But life got in the way as it does sometimes and my new hobby was quickly cast aside. I was attending Terra Nova Community Church and working on my field education with the staff. A friend began bringing her crochet along on Sunday morning and my interest was piqued. I pulled out my hooks and my tiny yarn stash and began again with a simple hat pattern. 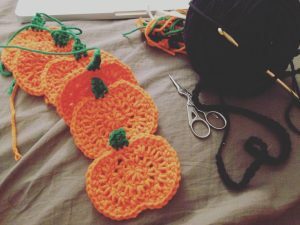 The week of Halloween is when I embarked on a journey of illness and recovery that changed the course of my path and I became what I like to call Chronically Creative. I spent 3 weeks in bed before I was admitted to Grady Memorial Hospital with pneumonia and pertussis (commonly known as whooping cough). Those three weeks I was pretty incapable of doing much of anything, but by the second day of my hospital stay I was on some pretty good pain medication and the antibiotics were working and I was getting a bit stir crazy, which is a feeling I would become very familiar with over the next 8 years. Popeye and I crocheting in bed during early years. I have since lost count of the total hats made during my 6 day stay at the hospital, but that was how I spent the majority of the time. I had my laptop and iPod along with me, but as you might know concentrating on much of anything is hard with a cough and fever. Crocheting quickly became an easy and welcomed distraction. When I was released from the hospital the doctor said that it would take quite awhile to heal, but as the days and weeks and months went by I was not feeling much better. The cough and fever were gone, but I was still as exhausted as I had been when I hospitalized. Simple tasks such as grocery shopping and showering where sometimes impossible. I was diagnosed with Fibromyalgia in the spring of 2008 and began my long journey to wellness. Thank goodness for streaming websites such as Hulu and Netflix because life outside my bedroom was going on without me. 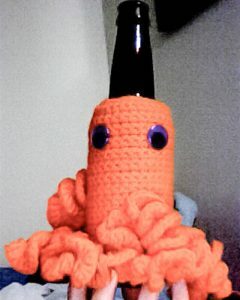 So I made hats, a lot of hats, a few scarfs, and then I started coming up with ideas of my own culminating in starting my business by selling a lone Octopus beer bottle cozy in the spring of 2010. My Ocotpus Beer Cozy has come a long way in 6 years. I did not start out with the idea being a business owner, running a shop or making a profit, however it seemed like a natural progression. I was overwhelmed with hand made items. For two Christmases I gave hand made gifts. And people really seemed to like what I was doing. I wasn’t just creating because I was keeping a shop, but because it felt unnatural not to. I felt good when I created, I felt productive, useful, and even a bit proud of what I was able to accomplish. I soon became aware of other people out there who were doing the same thing. Others with Fibromyalgia, Rheumatoid Arthritis, Lyme Disease, and even depression and anxiety were doing some form of creating. 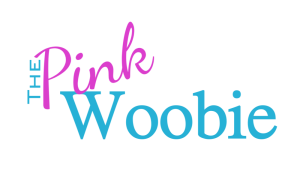 Not just crochet but quilting, jewelry making, and writing as well. My friends and I who were being separated from the everyday hustle and bustle of the healthy were carving out a place for ourselves and creating our own community. But chronic creativity is not just for those who are chronically ill. Although the word chronic has mostly negative connotations, it is defined as constant or reoccurring and can be a positive thing. A quick Google search for “crafting health benefits” gives me a quick 913,000 results. From CNN to Martha Stewart articles boast the benefits of crafting. Regularly creating can reduce stress and anxiety, improve your mood, keep your mind sharp, and help relieve pain. I didn’t need a neuroscientist to tell me this, but it is nice to see crafting of all kinds being promoted in the media as more than just a pleasant way to pass the time. Working on some fall inventory, a shop owners work is never done. Nine years after the illness that radically changed my life I find myself creating daily. It’s hard for me not to creative. If a day goes by when I have not picked up a crochet hook I get a little antsy. I’ve also added a variety of other crafts to my repertoire. Beside the fiber arts of crochet, knitting, and spinning, I also enjoy sitting at my sewing machine and practicing my straight lines, making jewelry, and drawing. I have a supportive community of crafters and people who enjoy purchasing hand made items. Although I spend most of my days in the four walls of my apartment with the cat, I know I am not alone and a lot of that is because of crafting. I am proud to call myself Chronically Creative. Do you create to deal with the stress of day to day life or a chronic illness? How did you get started? Are you looking to pick up a new hobby. The list below are some great resources that I have personally used. Purl Soho– An amazing online and brick and mortar shop located in Brooklyn. Their projects are delightfully simple and cover a variety of topics. The Zen of Making– Haley is my craft crush and she pretty much rocks the crafting scene. She is currently working on a book of what I know will be amazing cross stitch. But there is plenty on her site to keep you busy for a long time. 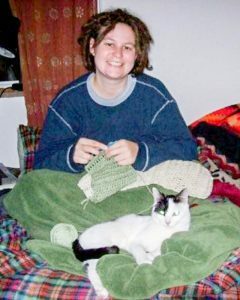 Ravelry– Patterns, forums, and photo galleries for all the fiber minded people.